Emily DeJesus of Milwaukee faced her computer monitor, entered her search criteria on Petfinder, said a little prayer and hit the send button. Her dog had died nine years earlier, and for years she’d said she would never go through that heartbreak again. Then something began tugging at her heartstrings, and she had the urge to open her heart to a furry friend once again. She had visited shelters but hadn’t found her soul mate, so she turned to the web. After lots of browsing through listings that matched her criteria, she spotted a Boxer posted by Affinity Rescue in Pardeeville, WI, that appealed to her. Unfortunately, when she contacted the rescue, the dog had already been spoken for. 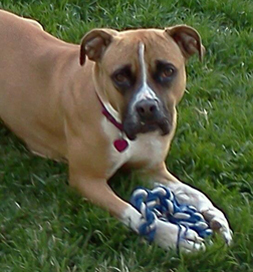 Linda at Affinity Rescue said she would contact Emily when another Boxer came into the rescue’s care. At Linda’s, a puppy came trotting up “to claim me for his own,” Emily remembers. But the only dog she was interested in was the Boxer called Jewel. At first the dog was shy, but she drew in closer, and as Emily signed the papers, the Boxer sat quietly at her feet. “I thanked Linda and her husband for bringing the light back to my eyes and heart,” Emily says. She changed Jewel’s name to Lola, but she calls her Lola of My Heart because that’s where the unconditional love between them resides.